Custom reverb was created so that the sound is as close to real life as possible, and users can choose from many different options. It is not a simple reverb plugin. High self EQ, Low & High cut, Gate sequencer and pitch on the reverb, early reflection and amazing sound! Original: Changes the volume of the original sign. Reflection: Changes the volume of the early reflection. This function is especially useful if it’s used to higher the sense of space. 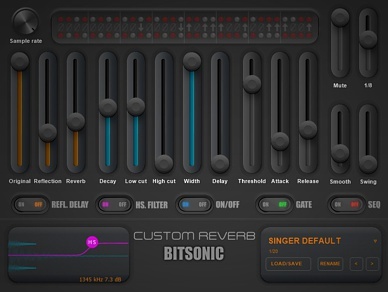 Reverb: Changes the volume of the traditional reverb. Decay: This function changes the reverb’s decay and fade time. Low cut: This filter cuts the deep range’s volume to fit the user’s wishes. It’s recommended to use this function in most cases. High cut: This filter cuts the high range’s volume. It’s not necessary to use it most of the time, but it’s recommended with longer decay values. Width: Reverb can be changed into both stereo and mono. Delay: This function delays the reverb compared to the original sign. If reflection delay function is on then the early reflection is delayed as well. Gate button: When on, the reverb fades based on the gate’s settings. Useful for creating the pumping sound of drums. Threshold: Belongs to the agate function. In dB this value starts the gate function. Attack: A value in millseconds, it sets when the gate is supposed to lower the volume. Release: Sets the the gate’s lowering time. HS Filter: When it’s on, the reverb’s high range can be raised or lowered on the graphic interface. SEQ button: When it’s on, using the gate sequencer the user lower or raise the volume of specific parts of the reverb without changing the original sign. Using this function the traditional reverb sound can be used as a special sound effect. Sample rate: The user can lower the sound quality of the reverb if the pattern function is on, and therefore the sound created with the sequencer can be further changed. Sequencer: The red leds are the sound heard in the timeline, the grey ones are the muted sounds. The top row is the left, the bottom row is the right side. Mute: If the value is high, the grey leds completely turn off the sound of the reverb at the given moment. If the value is at minimum this can be avoided. This function help with setting the ratio of the original and the mixed sign. Smooth: Changes the time of the gate created with the sequencer. If the time is short, the sound allowed by the red led will be short as well. On high value the gated sounds one after another will no longer be separate. Swing: Gate function is originally created for a simple 4/4 rhythm, this function changes that. Pitch: We can change the reverb of pitch between the sequencer leds. If the content on the graphic interface starts to flicker, the volume is too high. It’s recommended to lower it. © 2011 Bitsonic. All rights reserved.